A lot of the tables have couches instead of booths or chairs and it just seemed like a nice place to go with a group. I think we were the only ones there when we went though. My family ate there last weekend. 7 – from my understanding the new restaurant in place of Greenery sells seafood congee or something like that. Bummer! The fascia was on the side with the fat, so I was able to trim it off pretty easily. The rest of the steak was good, but as I said, had no marbling like I’m used to with a rib eye. I just ordered it online through waifood.com though I have previously ordered other stuff directly from them via their email. Either way, I didn’t see it ahead of time. I don’t know if they have a warehouse or just run it all out of their house or what. They seem pretty friendly so you could probably email them and ask them. Now that I see this post, I’m hungry. Really miss Chengdu, although I return in a day. i make a memeber card with Tony Roma, and can get discount if ur birthday. “Make a member card to get discount on birthday”, how’d that happen? Mind sharing some details? Tony Romas is overrated. Sauce is always the same. Porkchop is precooked with wired taste. Burger is ok, but doesnt worth 70kuai, sausage is cheap meat, the chicken is just bland. Service is good tho. They have crayons for kids to draw on the sheets. I buy meat from Metro. Not the imported one but the CHinese beef, it’s fresh. taste good too. YOu’ll have to trim the fat by yourself. If you are a picky eater like rick, buy the import stuff. On the way back from Qingcheng hotsprings on Sunday, I saw a new Walmart open in the west, thought I’d see if they had any import product for sale. 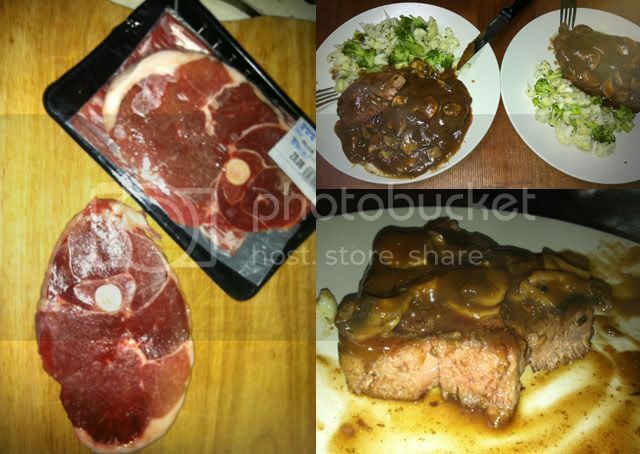 Ended up finding out they sell meat, and surprisingly they had some very nice lamb leg chops, here is a photo of the chops and how they ended up… note: the sauce is a strawberry (yes, it’s good :D) mushroom gravy reduction that the chop was glazed in after being seasoned>roasted..it looks like a ton of sauce, but I actually like it on the veg and only dumped it on the chop to maintain the nice veg colours 😀 all done in 1 skillet/toaster in about 20min. Note, while these were nice chops, you need to dig around to get the good cuts. Nothin sparks one’s pride like digging around for meat at WALMART. You never know what you’ll find at Walmart. I was just googling about where to buy nice cuts of beef in Chengdu coz I love cooking steaks at home and I came across this thread. Moved to Chengdu three weeks ago and I’m already craving a thick, tender, juicy and flavorful steak. I shopped at Whole Foods back in the US and is it possible to find anything close to that standard in Chengdu? Thanks guys. I shopped at Whole Foods back in the US and is it possible to find anything close to that standard in Chengdu? It is possible, but none of us have cracked it yet. I’ve eaten some awesome steaks in restaurants, but haven’t found anything quite up to par when shopping for beef. The magic beef is out there though, or I wouldn’t have enjoyed the T-Bones I have when eating out. Thanks Brendan. What are those restaurants? Are you still one of their proud customers? @ Brendan: Thanks I’ll definitely check it out. Whole Foods is great but gets real expensive when you shop there on the regular. I used to live right next to one and I went there a lot. Beat me to it! Trader Joe’s, that is my favorite grocery store in the states. Low prices and great stuff. True that it’s a bit expensive if we have to buy everything at full price. Vancouver has a few Whole Foods locations, and a few other delicatessen style supermarkets, all charging way over the odds for just about everything. I was always amused by one particular Whole Foods located opposite a Safeway… I could either pay $17 for a bag of my favourite coffee at the Whole Food store, or cross the street and pay $12. Funnier still were the Vancouverites paying the $17! !